This post summarizes the dev chat meeting from May 30th (agenda, Slack archive). Patches for any CS fixes are welcome, as long as they’re not so extensive that it would require refreshing an unreasonable amount of regular patches. In order to avoid wasting time, patches for violations which cannot be automatically fixed by `phpcbf` should be given preference over ones that can be automatically fixed. Regardless of many files are touched in a CS patch, the corresponding commits should be limited to fixing a single file in each commit. CS patches should be treated just like any other patch, and reviewed critically before being committed. That also applies to any changes made by `phpcbf`. Commits for new features, bug fixes, and other “logic” changes should not include unrelated CS fixes. Coding standards fixes should be done in a separate commit. If a line is already being changed to fix a bug, etc, then it should have CS violations fixed at the same time. If fixing the violation for that line would introduce changes beyond that line, though, then the CS fixes should be done in a separate commit. Does anyone strongly object to those, before they’re added to Handbook? The next meeting will take place on June 6, 2018 at 20:00 UTC / June 6, 2018 at 20:00 UTC in the #core Slack channel. Please feel free to drop in with any updates or questions. If you have items to discuss but cannot make the meeting, please leave a comment on this post so that we can take them into account. Join us on slack at 15:00 UTC. Core ticket #43481 is about tabs and placeholders to privacy tools page in wp-admin and a first version has been committed into dev. Goal is to have it inside the 4.9.6 release. 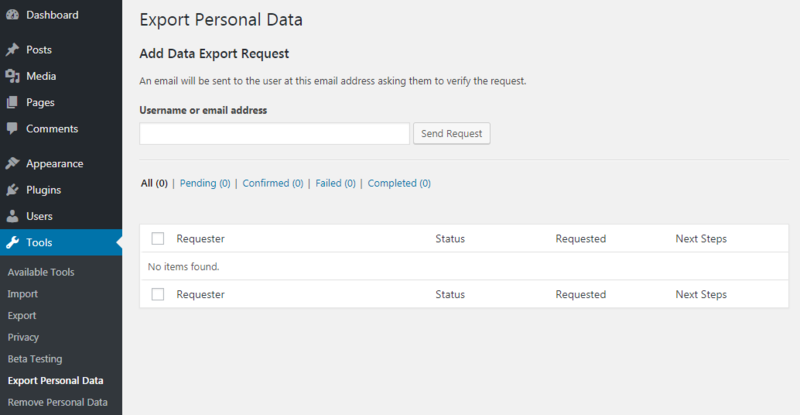 These screens will allow the site admin to get validation from the requester follow-up on requests. Requests could come in from different sources (email, phone request, contact page, etc) so a dedicated place is needed. Snippets are being collected in https://github.com/gdpr-compliance/info/blob/master/Privacy-policy-snippets.md and could be used where appropriate. @idea15 started with a document for dev guidelines: https://docs.google.com/document/d/1-qtKsNLzs-D8nqYa_y0slMrUJA-ctQhoXwr17m8CPZY/edit#heading=h.aatebk6ueh0r . Some parts of the above mentioned export.md would be needed in here. Help is needed to complete this document so please jump in. Please also add your comments to https://docs.google.com/document/d/1SI01SJbSzbU6MaOUrGSKK0JWOQ3Q1lVZtmJr6SJ59bw/edit . This document will go on the new privacy blog. The eventual section in the readme.txt will however not substitute the need of having the privacy information also delivered using filters/hooks as the purpose and possibilities are different. Another idea was to add a ‘Privacy URL’ keyword where a URL could be provided to a privacy statement hosted on a website. Documentation: what texts do we need? A table of contents of the needed information is present on https://github.com/gdpr-compliance/info/blob/master/information-resources.md . @idea15 started on some of them. After a chat with Mika, the guidelines for developers will be amended so that it's clear that plugins can assist in helping the site compliant but not that installing the plugin will make the site compliant. Marketing: How to announce the project to the world? @dejliglama reached out to the WhiP linking to make/core in their newsletter. There will be a longer piece later. A proposal is to get a post out every 2 weeks with a major one on 25-May. The roadmap can be used as a start, but might be slightly too technical for the broader public. #43492 was discussed. Data is stored for telemetry but also to make sure websites have the correct (security) updates. A site admin should not have to opt-in, because having a WordPress site without security updates is not acceptable. But a combination of some data (like website URL, IP, etc) might be seen as personal data. More clarification is needed. @pento and @pesieminski should be contacted. Design should arrive in the next days so Allen and Mike can start with the patches for their tickets. WordCamp Europe workshop: @idea15 will be hosting a GDPR Workshop at WCEU. She is looking for Teaching Assistants that can help her in making it a success. Please comment below (or DM on slack) if you are in Belgrade in June and are willing to support! WordCamp Europe contributor day: @idea15 has been contacted to be ready for questions during Contributor Day (June 14 in Belgrade). Anybody willing to help @xkon, @azaozz and probably @postphotos on that day? Leave a comment or DM. Cos a GDPR party don't stop until someone has a question about personal data. Moving towards GDPR compliance a new checkbox was added to the comments form in #43436. It asks the commenters for consent to set the comment cookies. However in many themes the <label> element inside the comments form is styled as display: block; which moves the checkbox above it and might seem unusual. This will be fixed in the default themes but please make sure to check if your theme would need to fix this too! Check out the Open trac tickets if you want to get involved!